Castle Llugwych is a large fortress in the central part of Ykalon in the Iliac Bay region. It serves as the headquarters of the Blades in the region. Because of its sensitive function, the castle is well-guarded. 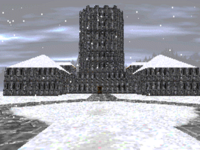 For game-specific information, see the Daggerfall article on Castle Llugwych. This page was last modified on 13 August 2018, at 16:20.